The kitchen is where families gather to cook favorite recipes, share meals and reconnect. It also is where two-thirds of home fires start. Keep your stove, oven and exhaust hood clean. Keep the cooking area around the stove/oven clear of combustibles, such as towels, napkins and pot holders, and keep appliance cords away from hot surfaces. Plug counter top appliances into GFCI-protected outlets and unplug them when not in use. Keep all appliances away from the sink. Do not use electrical appliances that have been wet. Water can damage the motors in electrical appliances. Make sure there is room behind the refrigerator for air to circulate. 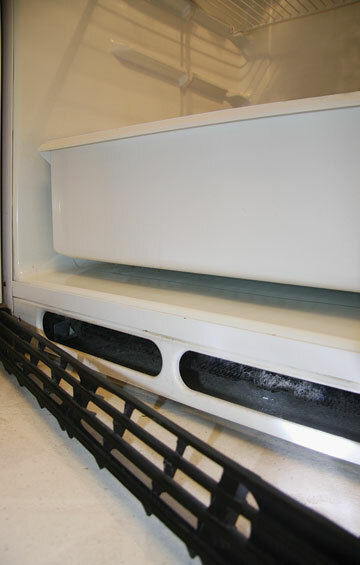 Vacuum refrigerator coils. Even a slight shock from an appliance can indicate a hazardous wiring condition. Turn the power to the appliance off at the circuit breaker. Do not touch it until it has been checked by a licensed electrician. The family room is where many people go to unwind and relax, but a lot of appliances are powered there. According to the Consumer Electronics Association, the average home has three televisions, two DVD players, at least one digital camera, one desktop computer and two cell phones. Many homes and their electrical systems were built before most modern-day home electronics and appliances were invented. Make sure electronics and computer equipment have plenty of space around them for ventilation. Examine extension cords before each use. Replace cracked or damaged cords. Do not place extension cords in high traffic areas, under carpets or across walkways. Extension cords are for temporary use, not as a permanent power supply. Use a surge protector to protect your computer and other electronics from voltage changes. Look for surge protectors with cable and phone jacks to protect your phone, computer modem and television. Heavy reliance on power strips is an indication you have too few outlets to meet your needs. Have additional outlets installed by a licensed electrician. The average adult spends one-third of every day in the bedroom. We are vulnerable while asleep. Thirty-six percent of people killed in home fires never wake up. Before installing a portable air conditioner, make sure the electrical circuit and the outlet can handle the load. Large window units should have their own electrical circuit so the system is not overloaded. Clean the unit at the beginning of every season. Check ceiling fans for a wobble, which will wear out the motor. To fix the wobble, turn off power to the ceiling fan and tighten the screws. Replace any lamp whose cord is damaged or cracked. Use the correct bulb wattage in fixtures. Bulbs with wattages too high for the fixture can overheat and start a fire. Always turn lamps off when you leave the room for an extended time. Unplug battery chargers or power adapters when equipment is fully charged. Use the proper charger for the size and type of battery you have. The basement is where some of your most essential—and expensive—home electrical equipment is kept. Heating equipment and electrical distribution systems are two of the leading causes of home fires. Check inside your electrical service panel to see when your system was last inspected. Be sure circuit breakers and fuses are correctly labeled with their amperage and the rooms, circuits or outlets they service. Use correct size and current rating for breakers/fuses. Consider replacing standard circuit breakers with AFCI breakers. Have your furnace cleaned and inspected annually by a licensed professional. Make sure all fuel-burning equipment is vented to the outside. Install carbon monoxide alarms on each level and outside each sleeping area. Clean the dryer lint filter after each load. Check periodically for excessive vibration or movement when the washing machine or dryer is operating, which can stress electrical connections. When a light goes out, it is hard not to notice the bulb needs to be replaced—unless you like sitting in the dark. But how can you tell if your power outlets are working properly? You don’t want an electrical fire to serve as your wake-up call that something is amiss. Ground fault circuit interrupter outlets and combination-type arc fault circuit interrupter circuit breakers are just some of the safety features in your home that need regular attention. May is National Electrical Safety Month—a time when public utilities educate consumers on ways to stay safe at home and on the job. But safety awareness shouldn’t stop on May 31. ESFI’s home safety calendar will help you remember when to perform routine maintenance and safety checks around the house. Some things—vacuuming coils and changing furnace or air conditioning filters, for instance—should be done every three months. Other items—such as testing GFCI outlets and smoke alarms—need to happen monthly. You can put the calendar on your refrigerator as a reminder of simple steps to take every month to keep your family safe. To learn more about home electrical safety, visit ESFI’s website at http://www.esfi.org or take the virtual home tour at http://virtualhome.esfi.org.